Mark DeRuyter moved to Dubuque to help his wheelchair-bound mother. Then his brother moved in. The family shared a cramped, two-bedroom apartment— and desperately needed more space. 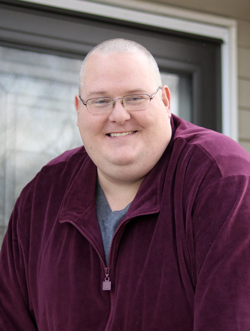 A free Dupaco Money Makeover showed DeRuyter that homeownership was possible. “I walked into Dupaco one day and walked out feeling like my entire life had changed,” he said. DeRuyter first met with Dupaco’s Andrew Houy in late 2015. Houy reviewed the new member’s entire financial picture and helped him create a game plan. Houy showed DeRuyter how to address some issues on his credit report, approved him for a small-limit Dupaco Visa® credit card and gave him a Credit Coach loan to build his credit. With the low-interest loan, the money that is borrowed is secured in the member’s savings account for the term of the loan. The member earns interest dividends on the money held in savings while payments to the loan help build credit. When Houy explained how Dupaco could help, it sounded too good to be true. DeRuyter had always had negative experiences with banks. Six months after his first meeting with Houy, DeRuyter’s score had soared, allowing him to buy his first house— a four-bedroom, walkout ranch that more than doubled his family’s living space. The first thing DeRuyter did was build his mom a handicap-accessible ramp. “Dupaco got me started on the road I needed to take,” DeRuyter said. I'd like to thank Andrew Houy for all of his assistance throughout my transition into homeowner and Dupaco Mortgage services as well as they were able to secure me an incredible APR on my loan. Top notch service all around. Mark DeRuyter bought his first home with First Choice Realty LLC and I had the pleasure of being his real estate broker. Thank you Mark for allowing me the honor of working with you, I wish you many years of happiness in your new home.